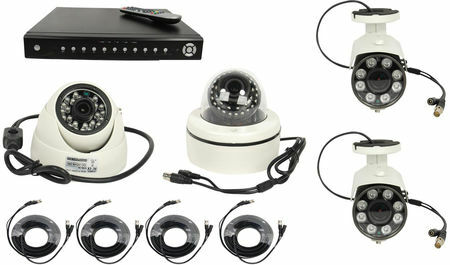 The IntelliSpy 4 Channel HD DVR offers the best viewing and recording clarity at an affordable price. These HD cameras and DVRs give you very clear images even when an object is moving. Analog systems and other HD systems have a blurry image when a moving object is in the field of view. The new 3G SDI technology allows for a crisp clear picture of the movement. This is perfect for viewing license plates and you can even see someone wave at you, all without the trailing image effect. All 4 channels display and record in crisp and clear high definition 1080p (1920x1080). This is a 4 channel standalone DVR with an embedded Linux operating system but is programmed and is designed to operate like a PC based DVR. The HD DVR is programmed and controlled with an easy to use GUI (graphical user interface). This system comes with a remote and mouse for easy operation. It uses H.264 compression which is a high quality compression and uses less storage space to maximize your hard drive usage. You can record up to 5.5 days of constant recording with a 1TB hard drive. The DVR can be accessed remotely to see live video using a smart phone, tablet, and iPad. Remote set-up is fairly easy with limited network knowledge. Just forward a couple of ports in your router and then take a picture of the QR code on the DVR to connect your device to the DVR. You can also view live video using most web browsers. The 4 channel HD IntelliSpy DVR like many other DVR's has motion detection recording so you don't eat up a ton of storage space and makes it easier to find an event rather than skimming through hours of video footage. This model is available with 1TB or 2TB hard drive. Select up to 4 cameras shown below and the HD Video/Power cables in the appropriate lengths below. Select an optional monitor below to complete your system.